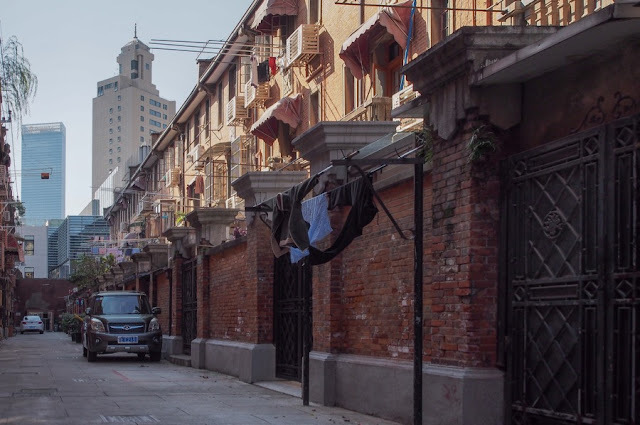 A slice of old-time Shanghai, a hidden residential neighbourhood that survives between the skyscrapers- and may even be on its way to hipsterfication. There's only so many Gucci shops one can take in on a trip to Shanghai. And although calling the city's transformation in the past two decades 'impressive' would be an understatement, sometimes it's nice to find bits of urban space that have survived the onslaught of capitalism and consumerism. Jing'An Villa is a small residential lilong area that's an oasis of 1930's residential calm between the shiny glass malls of Nanjing Lu and Jing'an district. Olden days architecture survives along doting grannies who probably lived here all their lives. There's talk of this turning into the next Xintiandi- which may be premature but visit quickly, just in case. Directly off downtown Shanghai's main shopping thoroughfare, at 1025 Nanjing Xi Lu (Nanjing West Rd). Map. IT IS EASY to be overwhelmed by Shanghai. Although fairly efficient as far as urban jungles go, the relentless transformation of the place in the past 20 years or so have created a steel-and-glass metropolis with more shopping malls than you can shake a stick at. It didn't use to be like that. 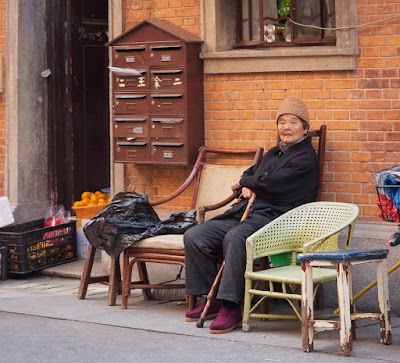 Although nationalistic Chinese hate to be reminded of it, Shanghai's first glory days were when the city was basically a Western colony, with large parts of the area carved up in distinct enclaves run by Europeans and Americans. At the edge of the International Settlement, on the road to the Jing'An temple, a wealthy Chinese tycoon, Zhang Jingjiang, made a smart real estate deal by buying a plot of land, razing the existing buildings, and converting it to some luxury condominiums for the city's wealthy few. (Sounds familiar?) 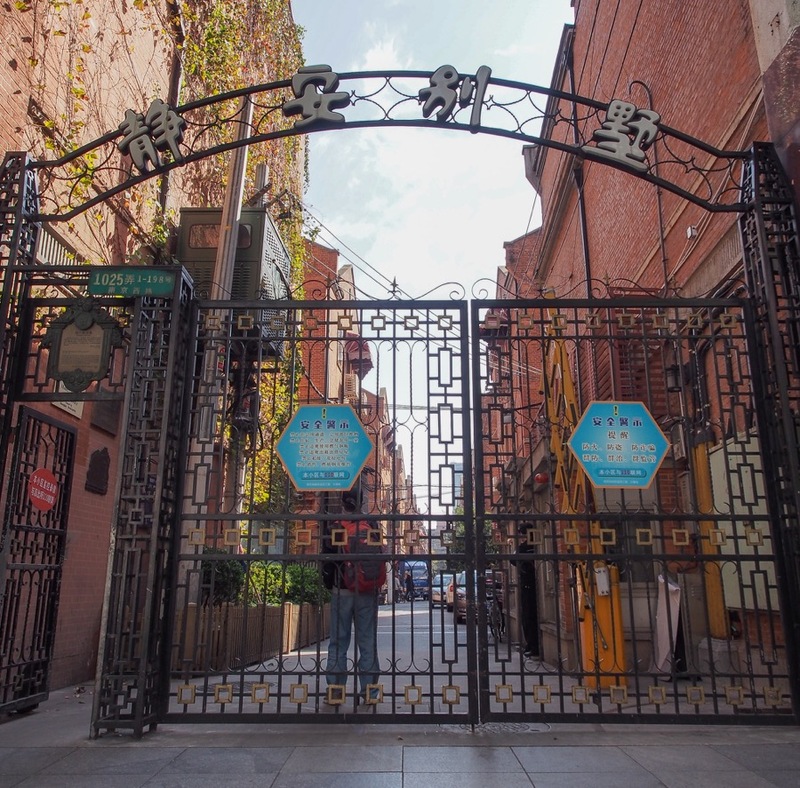 In 1932 Jing'an Villa (靜安別墅) opened its gate for residents to move in, the smart red-brick terraced houses reminiscent of English townhouses. 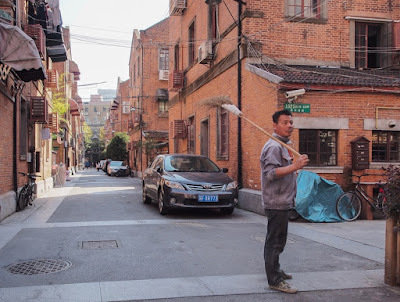 It's interesting to dwell for a few seconds on Zhang Jingjiang, the guy who commissioned Jing'An Lane. Quite a remarkable figure- although you won't find much information about him in (nominally) communist Shanghai. He was an interesting mix of political revolutionary and fat-cat businessman. 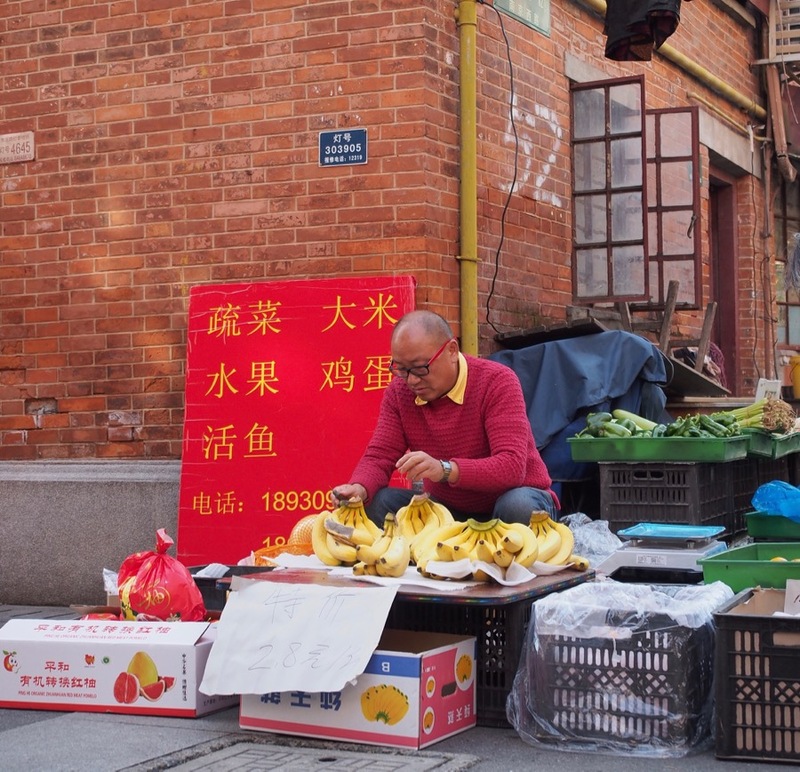 Taking advantage of the first wave of globalisation sweeping the Chinese economy, Zhang started his career in Paris in the early 20th century, trading in Chinese art and silk. Here he also became an anarchist- bent on overthrowing the old world order. He was a major financial donor to Sun Yat Sen's 1911 Revolution that sniffed out the Chinese imperial Qing dynasty. When he made it back to Shanghai, he dabbled in the Stock Exchange and multiplied his wealth. He was a financial founder of the Kuomintang (KMT) and good buddies with Chiang Kai-Shek, and by extension a fierce anti-Communist (which is why you won't learn about him at Jing'an Villa). He eventually left China and is buried in New York City. 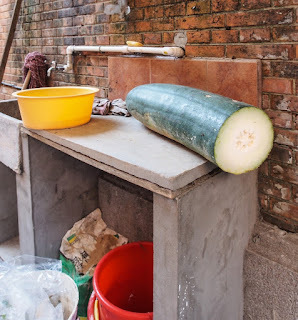 It's ironic that somebody who dedicated most of his life (and his hard-earned cash) to creating a different, better China has been seemly forgotten by history and left little traces behind, except for these brick buildings, just now when China is seeing its biggest changes ever. History is cruel. OK, back to Jing'an Villa. 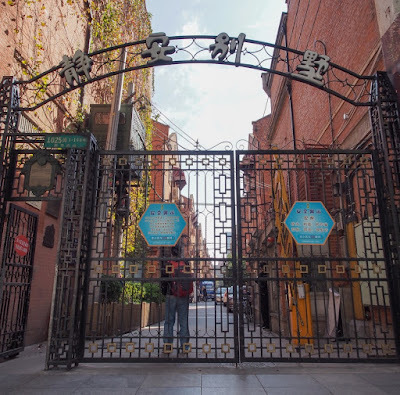 Back in 1932, like most desirable real estate, it offered the best of both worlds: right off of Bubbling Well Road (now called Nanjing Xi Lu) which led straight to the Bund and the downtown business area, as well as providing easy access to the greener countryside outside the city. It was a swanky place to live for the swanky Western (and Chinese) elite. The gracious main entrances with Art Deco-inspired brick pillars- always facing south for the best light. After 1941 the Westerners were unceremoniously booted out, the International Settlement was dissolved, and when the Communists took over (pushing out the KMT to Taiwan) Jing'an Villa's generous residences were subdivided and acquired a more proletarian set of inhabitants. 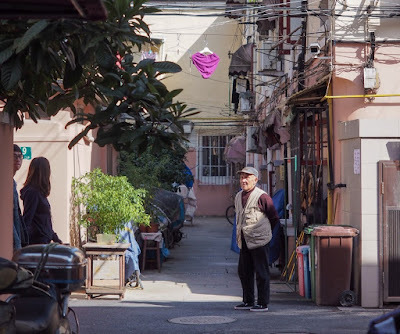 Still home to almost 3000 residents, it is a typical Lilong neighbourhood, comprising numerous of small lanes that create a real sense of community. And community is what makes this place still attractive to wander. Of course there's the architecture, which is almost a century old and a clashing contrast with the glass shopping malls on Nanjing Xi Lu. 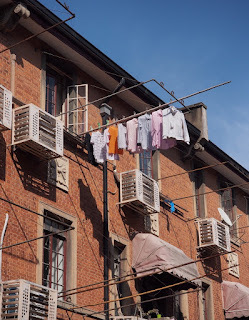 When you walk through Jing'an Villa's gate you step inside a local neighbourhood, where grannies shoot the breeze on chairs in front of their house, spring onions are being prepared al fresco, and animal protein (and copious quantities of laundry) hangs dangling from the sky.You want to know what Shanghai was like 40 years ago? This is probably the closest you can get. Somebosy is having spring onions for lunch! 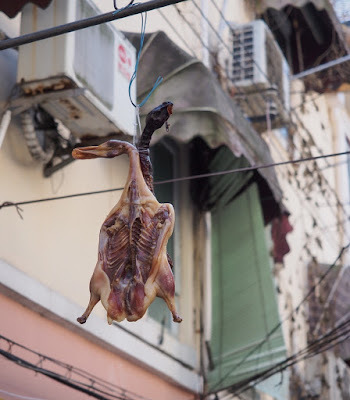 Or Shanghai Duck for dinner? The Mother of all courgettes.That's going to be a BIG bowl of vegetables. 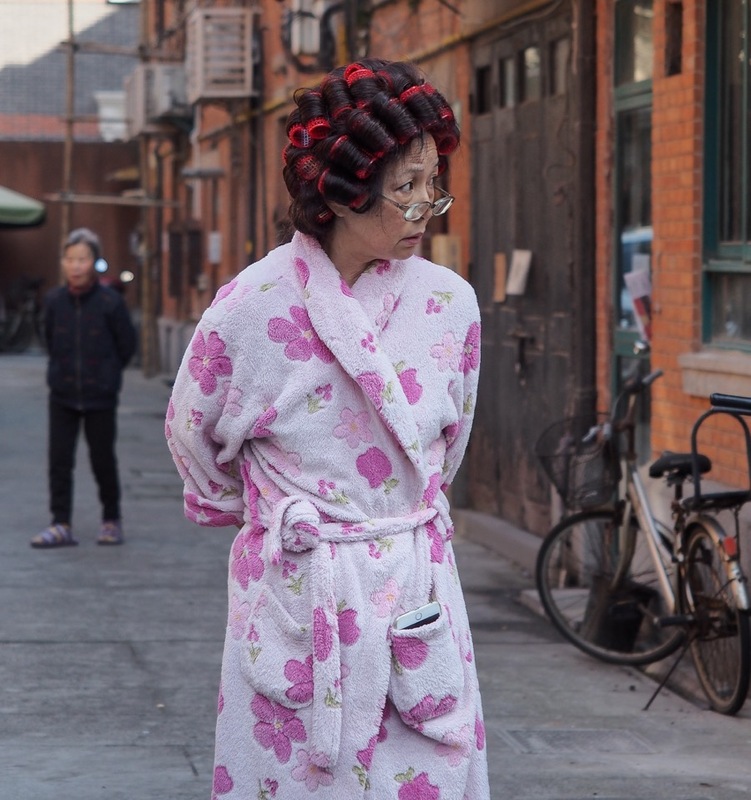 This is where the locals let their hair down- or stick it up in curls, like the lady below! Keeping an eye on the 'hood. 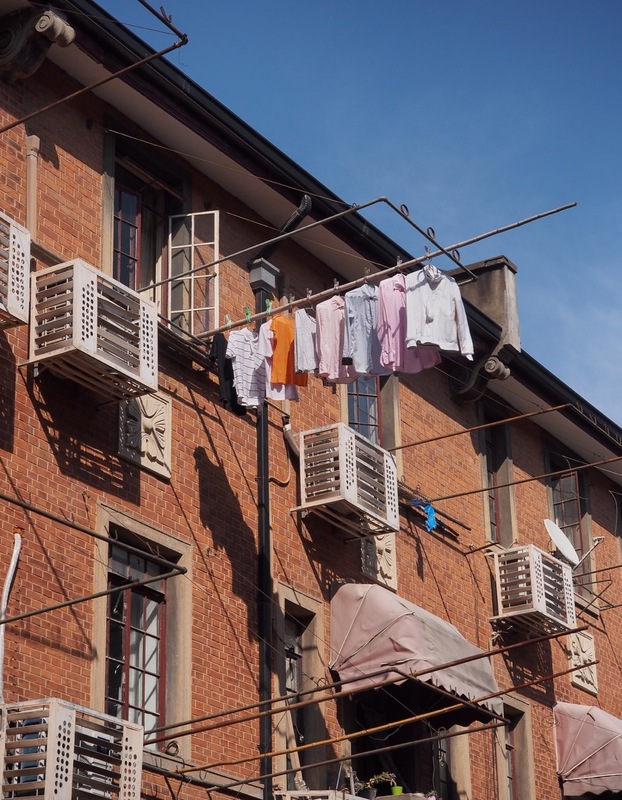 Apartments boast fully automated laundry dryers. There's been talk about hipsterisation and the mushrooming of trendy boutiques here, but it's not about to turn into another Xintiandi or Tianzifang soon. Apparently the authorities have cracked down on some of the creative types that had opened unlicensed boutiques here. On our November 2016 visit we saw very few bohemians- unless you count the red-sweatered gentleman below whose glasses are hipster supreme. We did manage to have a local haircut in a friendly neighbourhood salon, but at 15 RMB (about $2) for a quick cut it could hardly be called a boutique treatment! The local hipster boutique. Bananas are super trendy this week. Still life with Grandpa and pink knickers. - For more on these vanishing neighbourhoods, Shanghai Street Stories is essential reading. 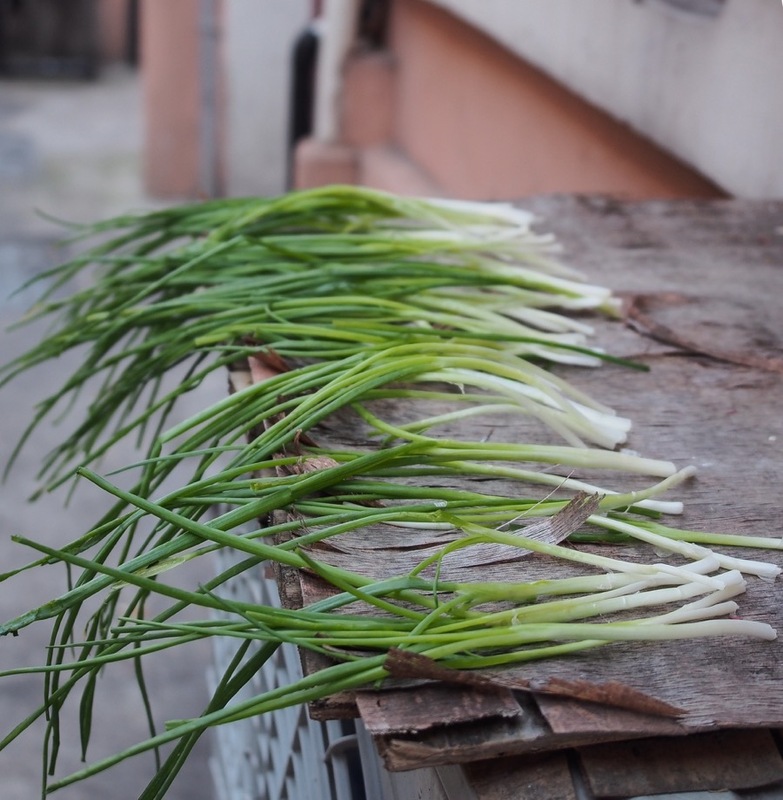 - Anthropologist Non Arkaraprasertkul lived in Jing'an Villa for a year and shares his experiences.